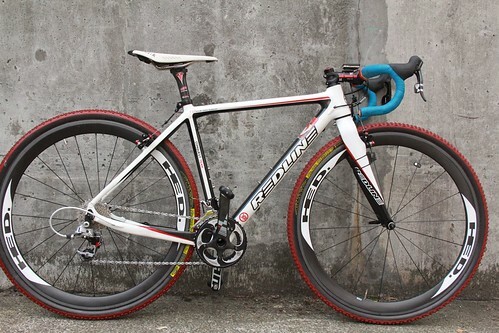 With the 2012 Conquest Carbon, longtime cyclocross stalwart Redline steps into the carbon era with a machine that is both drastically different from their previous offerings and yet a wholly mature design. With its tapered steerer carbon fork, internal cable routing, BB30, and disc compatibility, the Conquest Carbon has all the latest bells and whistles, but I’m struck by how the basic lines of the bike are so straightforward. When designers draw out carbon road bikes, too often they take a simple machine and add “flare” to make it stand out in the market place. And if that doesn’t really detract from the bike’s function, it’s because caliper brakes are simple to mount and the rider only touches the bike at the bar, saddle, and pedals. 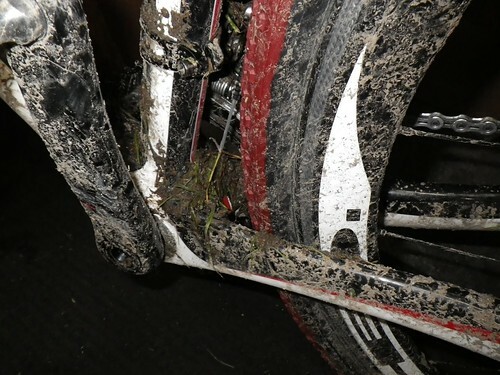 But during a cyclocross race, a rider is all over the bike, beside it, under it…cantilever brakes are typically messy in their routing and even disc brakes are deceptively difficult to accommodate. Plus you have to worry about mud, grass, or snow building up on the bike. When frame designers decide to add styling features to a cyclocross frame so as to create a family resemblance to the rest of the brand, the results usually detract from the performance and ergonomics of the bike. Conversely, the design of the Conquest Carbon is deceptively simple in its execution, with all the functional elements in harmony. Those five years of development allowed Redline to refine design, and the new bike emerges as a well thought out gestalt that nevertheless shows clever improvement in nearly all details. With its debut, the brand’s aesthetic utterly resets. It’s no surprise that the only other Redline product that the Conquest Carbon resembles is the “Project 79” Flight Carbon BMX bike, a wildly ambitious yet fully realized design in its own respective category. The carbon frame is a monocoque design with the only metal being in the BB sleeve and brake bosses (including disc mounts). Setting aside disc brakes for the moment, that BB sleeve completely isolates the direct-fit BB30 bearings from the inside hollow of the frame, so as to prevent water inside the frame from pooling at the bearings. The BB30 bearings offer some weight savings over external bearing, threaded BB, but combining that with a light alloy 30mm spindle crankset yields a motherlode in weight savings. 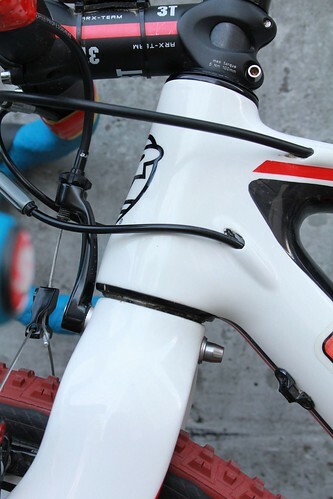 The shifter and rear cantilever brake cables are internally routed, not for aerodynamics, but rather for improved ergonomics, reduced cable friction, and better protection from contaminants. I rarely think about the fact that my road bikes do not have internal routing, and when I do remember, I don’t care. Every time I lifted the Conquest Carbon over a barrier, I was pleasantly reminded that there were no exposed cables in my grasp or rubbing my arms and shoulders, and indeed there was less cable run to catch mud and grass flung from the course. 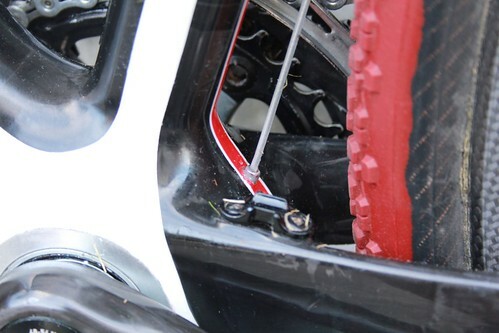 The peaked cross-section of the chain stays and the shape of the bike behind the BB also reduce mud buildup, unlike other carbon bikes that often have boxy transitions to the chain stays that may as well be a flatbed truck for hauling mud around the course. The Redline’s tapered steerer, full-carbon fork is in line with what is quickly becoming the new standard for cross bikes. One and a half inches wide before tapering, the steerer allows the best shape for the carbon fibre as it transitions off the generous clearance fork crown, allowing a light fork that has good stiffness and resistance to fatigue. The Conquest Carbon uses an internal, or semi-integrated, headset standard that consists of press-in cups that sit almost entirely within the head tube. 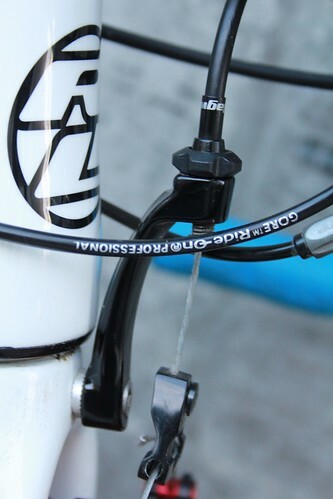 The fork crown is moulded with a hole to allow a crown-mounted cable stop for the front cantilever brake, though the stock FSA headset features a cable stop integrated into the bearing cap. The 2012 version does not have provision for a disc-brake caliper on the fork, though one would expect that will soon be an option on future models. 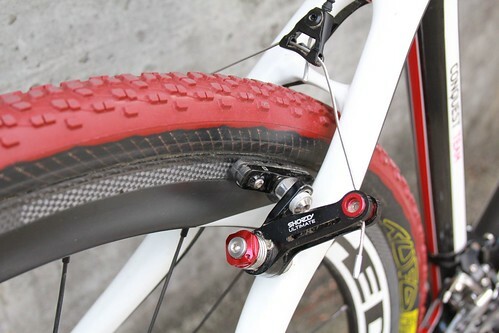 The bike has a post-type, disc brake caliper mount that accepts a rear 140mm rotor, or larger with adapter. Smartly, the routing for the caliper uses continuous housing through zip-tie guides along the down tube and chain stay, so it will be easy to service the rear brake whether it is cable-actuated or the eagerly-awaited hydraulic system. While the world waits on the definitive cyclocross disc brake system, the Conquest Carbon has smart provisions for cantilever brakes at the rear end. The continuous housing routes internally through the top tube, which is nicely ovalized laterally so that it doesn’t dig into your shoulder while portaging, and then exits to a cable stop integrated into the seatpost collar. I particularly like this collar on small bikes like mine because it insures that there will be enough space to properly position the cable straddle while eliminating the slop and flex in the setup. In another nice detail, the barrels of the canti bosses run through the seat stays’ large diameter. 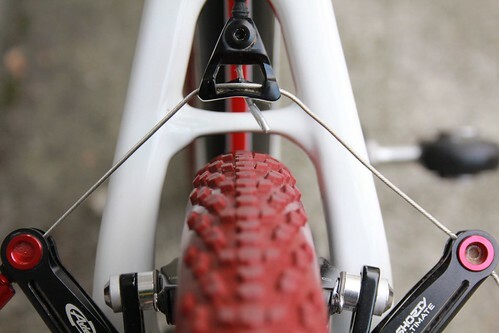 This “pierced” seat stay design boosts brake response by resisting the twisting force the bosses experience when the canti brakes are employed. 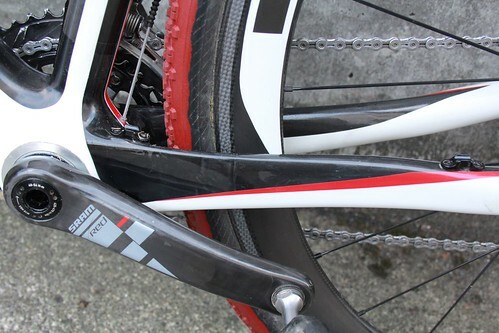 Perhaps because of these canti bosses and the seat stays’ robust sections, the seat stay bridge are made quite slim. Luckily so, since it is not situated particularly high off the rear tire, although I am using big, UCI-defying 34mm tubulars on the bike. To be fair, I never noticed buildup on the bridge after my races. For the product designers at Redline, choosing the rear spacing was a dilemma, because while cyclocross bikes to date have used the road bike standard of 130mm OLD (over-locknut distance), almost all hubs that will accept a brake rotor are sourced from mtn bikes, i.e. 135mm OLD. Since dedicated cx disc-brake systems were not going to debut in the 2012 model year, Redline chose to go with 130mm, but I can see how they have designed the Conquest Carbon’s rear dropouts in way that implies that the mould could be easily changed to 135mm. The Redline’s geometry has been described as having a somewhat low bottom bracket height and sharper handling than traditional. There is ambiguity on just what constitutes “traditional cyclocross geometry”. Recently I had heard that traditional European bikes had somewhat upright angles and a distinctly high BB, not for clearing trail obstacles, but for the deep sand featured in a lot of Dutch cross courses. Yet for the most part the European bikes have never been designed to fit really big tires. For the longest time, cross tubulars had been 28-32mm and with the recently UCI revision to max tires size (32mm down from 34), there’s no real point in designing competition bikes with superfluous clearance. In the American perspective, cyclocross races in the 1990s were often put on my mountainbike organizers who devised technical courses that would attract a similar racer. I’ve heard of such courses being referred to as “jungle cross”. Mountainbike framebuilders at the time revelaed their influences in making bikes with big tire clearances, high BBs, and fairly slack angles; in particular I remember a bike that Jeremy Sycip built in the early 1990s. Jeremy learned a bit of frame building from Paul Sadoff of Rock Lobster. 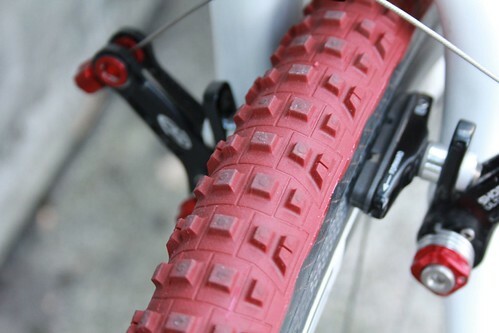 To this day, Rock Lobster builds cyclocross bikes in either their standard version that will fit up to 45mm tire or “euro” geometry that will fit 35mm. With the explosive growth of the sport here in the states, cross courses have become faster and less technical, calling for bikes that are a little more criterium and a bit less singletrack. I found the Conquest Carbon to be a well balanced machine over a variety of terrain, and the front end was particularly precise in the turns. I switched to the Redline halfway through the season, and I immediately felt confident enough to use the corners and technical descents to my advantage (though this is partially explained by having finally perfected my brake setup on a cyclocross bike). The bike sprints like a champ and was superb on short power climbs, which was aided by its highly competitive sub16.5-lbs weight as pictured. Was the carbon vertically compliant yet laterally stiff? Well, if I was riding the bike on pavement for a couple hours on clinchers pumped to 110psi, I guess I could say that the bike was pleasantly smooth enough, but while drilling it for 45min on a cross race I don’t really care about vertical compliance. That’s what good tubular tires are for. What I care about is low mass and enough rigidity that I can punch it out of the corners. The cyclocross courses have proportionally many times more turns than road racing, and it’s not like a fast criterium where you can carry most of your speed through the turn. You’ll need a cross bike that you can muscle through slow speed turns and then blast thru the exit; next month when the gravel grinder races start, I’ll have be more appreciative of carbon’s vibration damping. Which brings me to the topic of the bike’s versatility. With dual bottle mounts, this bike is as well fitted as any high-performance road frame (albeit with fatty tires) but not a single step beyond that. That means no fender or rack mounts. Depending on what you consider necessities, that could be an obstacle to your purchase if you were looking for a winter trainer or all-weather road bike, but the frameset lends itself well to enduro road rides, gravel grinders, and what I’d call “adventure road riding” (other people call it “getting lost on rural roads and taking ill-advised shortcuts”). You could always resort to SKS RaceBlades or similar. If the Redline had a disc compatible fork (perhaps I should say “when it has”), the bike’s light weight and agile-by-CX standards handling would make it high performance disc brake road bike. If you are looking for an offroad bike, then the Conquest Carbon geometry doesn’t suite really gnarly singletrack nor does the bike accept tires fat enough to impinge on 29er territory. 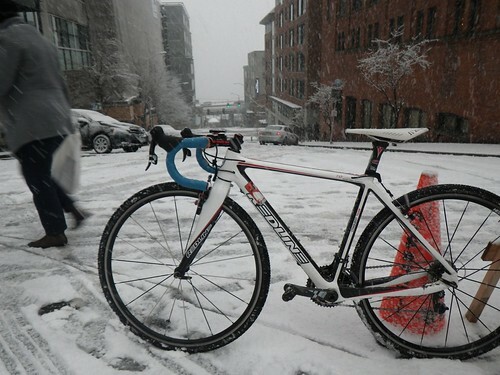 To be honest, this bike was designed first and foremost as cyclocross competition equipment. At $1600 for the frame/fork/headset, the Conquest Carbon is a good value; European brand bikes with similar features often cost more (maybe sans bottle mounts even). This isn’t to say that you need to qualify choosing the Redline by pointing to its relatively modest cost, because it’s a solid performer period. The Redline Conquest Carbon that you see here was built up with a couple tricks to fit me better than stock. 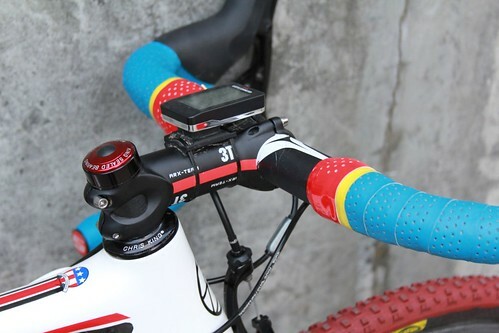 Specifically, I wanted the stem as low as possible and the original FSA headset with integrated cable hanger wasn’t ideal for that. FSA probably makes a suitable headset that has a minimal stack bearing cap without the hanger, but they also make 200 hundred other headsets, so good luck figuring that out. And if by chance you find the right product code, it’s not that likely to be found in most distributor catalogs. Kinda frustrating. Chris King only makes about twenty different headsets, not including colours. The only one that fits the Conquest Carbon is called the i-2, and a short stack is the only option. The path of least resistance became my solution, but it hurt me in my wallet. Now that I had dropped the stem down low, I needed to provide a cable stop for the front cantilever brake. Even if a mini-linear pull brake would obviate the need for the cable stop, I no longer consider linear pull brakes desirable since they don’t have the mud clearance to deal with the worst courses I saw this fall. TRP makes a very smooth action and visually elegant crown-mount cable stop. However, you will need a longer bolt than TRP provides because the Redline fork crown is magnum-sized wide. Also, you cannot use the TRP’s road caliper style recessed nut. Instead I used the fixing nut from a V-brake pad with some stainless steel washers between the nut and the carbon. I set it up once, and it never loosened. In these photos, the camera lens makes the 34mm Tufo look even bigger within the seat stays than it actually is. Though if in truth the stays are not overly generous on clearance, after muddy race conditions the cantilever brake arms caught more debris than the fairly clean stays and bridge. Below you can see grass stuck to the back of the BB area. It looks like there’s a lot glommed on, but if you compare to the photo of the bike clean you can tell that it’s just a thin layer. When there’s no grass in the mud, the debris mostly just fell off.